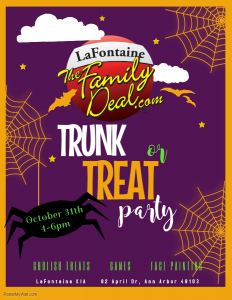 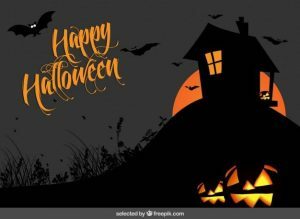 LaFontaine Ford of Birch Run, will be hosting a Trunk or Treat & Something Sweet on October 29th, 2018 from 5:00 to 7:00 PM at 11661 North Beyer Rd, Birch Run, MI . 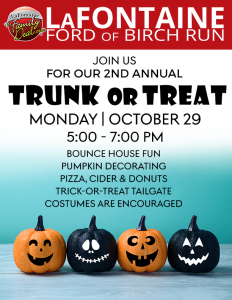 This event is hosted by LaFontaine Ford of Birch Run and welcomes all of the Birch Run community to attend. 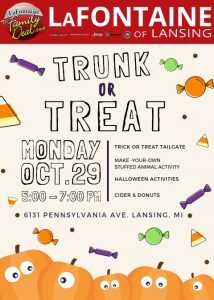 There will be trick-or-treating, cider & donuts, and pumpkins to decorate! 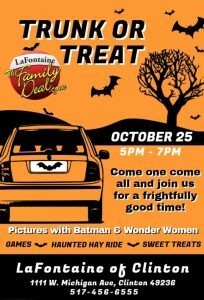 Costumes are welcome! 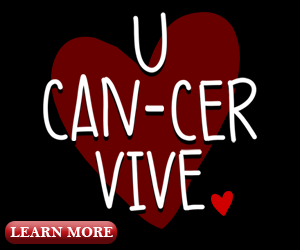 For more information, please follow our Facebook Page!